"Goosefoot" redirects here. For other uses, see Goosefoot (disambiguation). Chenopodium is a genus of numerous species of perennial or annual herbaceous flowering plants known as the goosefoots, which occur almost anywhere in the world. It is placed in the family Amaranthaceae in the APG II system; older classification systems, notably the widely used Cronquist system, separate it and its relatives as Chenopodiaceae, but this leaves the rest of the Amaranthaceae polyphyletic. However, among the Amaranthaceae, the genus Chenopodium is the namesake member of the subfamily Chenopodioideae. In Australia, the larger Chenopodium species are among the plants called "bluebushes". 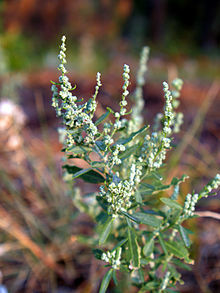 Chualar in California is named after a Native American term for a goosefoot abundant in the region, probably the California goosefoot (Blitum californicum). The species of Chenopodium (s.str., description according to Fuentes et al. 2012) are annual or perennial herbs, shrubs or small trees. They are nonaromatic, but sometimes fetid. The young stems and leaves are often densely covered by vesicular globose hairs, thus looking farinose. Characteristically, these trichomes persist, collapsing later and becoming cup-shaped. The branched stems grow erect, ascending, prostrate or scrambling. Lateral branches are alternate (the lowermost ones can be nearly opposite). The alternate or opposite leaves are petiolate. Their thin or slightly fleshy leaf blade is linear, rhombic or triangular-hastate, with entire or dentate or lobed margins. Inflorescences are standing terminal and lateral. They consist of spicately or paniculately arranged glomerules of flowers. Plants are monoecious (rarely dioecious). In monoecious plants flowers are dimorphic or pistillate. Flowers consist of (4–) 5 perianth segments connate. basally or close to the middle, usually membranous margined and with a roundish to keeled back; almost always 5 stamens, and one ovary with 2 stigmas. In fruit, perianth segments become sometimes coloured, but mostly keep unchanged, somewhat closing over or spreading from the fruit. Pericarp membranous or sometimes succulent, adherent to or loosely covering the seed. The horizontally oriented seeds are depressed-globular to lenticular, with rounded to subacute margin. The black seed coat is almost smooth to finely striate, rugulose or pitted. The genus Chenopodium contains several plants of minor to moderate importance as food crops as leaf vegetables – used like the closely related spinach (Spinacia oleracea) and similar plants called quelite in Mexico – and pseudocereals. These include white goosefoot (C. album), kañiwa (C. pallidicaule) and quinoa (C. quinoa). On the Greek island of Crete, tender shoots and leaves of a species called krouvida (κρουβίδα) or psarovlito (ψαρόβλητο) are eaten by the locals, boiled or steamed. As studied by Kristen Gremillion and others, goosefoots have a history of culinary use dating back to 4000 BC or earlier, when pitseed goosefoot (C. berlandieri) was a staple crop in the Native American eastern agricultural complex, and white goosefoot was apparently used by the Ertebølle culture of Europe. Members of the eastern Yamnaya culture also harvested white goosefoot as an apparent cereal substitute to round out an otherwise mostly meat and dairy diet c. 3500–2500 BCE. There is increased interest in particular in goosefoot seeds today, which are suitable as part of a gluten-free diet. Quinoa oil, extracted from the seeds of C. quinoa, has similar properties, but is superior in quality, to corn oil. Oil of chenopodium is extracted from the seeds of epazote, which is not in this genus anymore. Shagreen leather was produced in the past using the small, hard goosefoot seeds. C. album was one of the main model organisms for the molecular biological study of chlorophyllase. Goosefoot pollen, in particular of the widespread and usually abundant C. album, is an allergen to many people and a common cause of hay fever. The same species, as well as some others, have seeds which are able to persist for years in the soil seed bank. Many goosefoot species are thus significant weeds, and some have become invasive species. This is another of the salt-bushes, which, besides being invaluable food for stock, can be eaten by man. All plants of the Natural Order Chenopodiaceae (Salsolacese) are more or less useful in this respect. Journal de la Ferme et des Maisons de campagne, quoted in Pharm. Journ. viii., 734. Certain species grow in large thickets, providing cover for small animals. Goosefoot foliage is used as food by the caterpillars of certain Lepidoptera. The seeds are eaten by many birds, such as the yellowhammer (Emberiza citrinella) of Europe or the white-winged fairy-wren (Malurus leucopterus) of Australia. Goosefoot pathogens include the positive-sense ssRNA viruses - apple stem grooving virus, sowbane mosaic virus and tobacco necrosis virus. The genus Chenopodium was described by Carl Linnaeus in 1753 (In: Species Plantarum, Vol. 1, p. 218–222). Type species is Chenopodium album. This generic name is derived from the particular shape of the leaf, which is similar to a goose's foot: from Greek χήν (chen), "goose" and πούς (pous), "foot" or ποδίον (podion), "little foot". In its traditional circumscription, Chenopodium comprised about 170 species. Phylogenetic research revealed, that the genus was highly polyphyletic and did not reflect how species were naturally related. Therefore, a new classification was necessary. Mosyakin & Clemants (2002, 2008) separated the glandular species as genus Dysphania and Teloxys in tribe Dysphanieae. Fuentes-Bazan et al. (2012) separated many species to genera Blitum (in tribe Anserineae), Chenopodiastrum, Lipandra, and Oxybasis (like Chenopodium in tribe Atripliceae). They included Rhagodia and Einadia in Chenopodium. †Chenopodium wetzleri fossil seeds of the Chattian stage, Oligocene, are known from the Oberleichtersbach Formation in the Rhön Mountains, cental Germany. ^ a b c d e f g Susy Fuentes-Bazan, Pertti Uotila, Thomas Borsch: A novel phylogeny-based generic classification for Chenopodium sensu lato, and a tribal rearrangement of Chenopodioideae (Chenopodiaceae). In: Willdenowia. Vol. 42, No. 1, 2012, p. 5-24. ^ a b Gelin Zhu, Sergei L. Mosyakin & Steven E. Clemants: Chenopodium - In: Wu Zhengyi, Peter H. Raven, Deyuan Hong (Hrsg. ): Flora of China. Volume 5: Ulmaceae through Basellaceae. Science Press/Missouri Botanical Garden Press, Beijing/St. Louis 2003, ISBN 1-930723-27-X, p. 378-. ^ Chisholm, Hugh, ed. (1911). "Chenopodium" . Encyclopædia Britannica. 6 (11th ed.). Cambridge University Press. p. 80. ^ J. H. Maiden (1889). The useful native plants of Australia : Including Tasmania. Turner and Henderson, Sydney. pp. 15–16. ^ English Names for Korean Native Plants (PDF). Pocheon: Korea National Arboretum. 2015. p. 407. ISBN 978-89-97450-98-5. Archived from the original (PDF) on 25 May 2017. Retrieved 24 December 2016 – via Korea Forest Service. ^ The floral change in the tertiary of the Rhön mountains (Germany) by Dieter Hans Mai - Acta Paleobotanica 47(1): 135-143, 2007. Sukhorukov, Alexander P.; Zhang, Mingli (2013). "Fruit and Seed Anatomy of Chenopodium and Related Genera (Chenopodioideae, Chenopodiaceae/Amaranthaceae): Implications for Evolution and Taxonomy". PLoS ONE. 8 (4): e61906. doi:10.1371/journal.pone.0061906. PMC 3633980. PMID 23626750. Wikimedia Commons has media related to Chenopodium.